There is nothing I like more than seeing photographs in print. There’s something quite nostalgic and fun about digging out old photo albums and prints with the family and having a good giggle at that one time Uncle Dave drank a little too much wine and broke out the air guitar on the dance floor at your sisters wedding. So although the world we live in today is that of a digital age I still feel that it is incredibly important to show off your wedding photographs in print for all to see instead of left on a USB tucked away in a draw somewhere long forgotten. The wedding albums I produce for my clients are beautiful, handcrafted pieces. They are works of art. Available in an array of different designs they are extremely tactile, and are personalised exclusively for you. Decide the heading on the cover and it can either be laser etched, embossed or UV Printed to bring a touch of luxury right from the beginning. Decide on various cover options from leatherette, linen or natural hessian in an array of colours to match your wedding theme. Then decide on the type of album you prefer. There are 3 choices. The Perfetto album with it’s iconic seamless look and choice of lustre or metallic paper. The Fine Art album with tactile fine art cotton paper and lay-flat page design exuding style and sophistication or the perfect form of digitalmeets-traditional with the Book and Wooden Box combo containing a quality book with up to 30 spreads and an 8GB USB stick, beautifully presented within a complimentary wooden box. Your album is typically made up of 15 spreads (30 pages) but you can add as many pages as you wish. The decisions are all yours and I am here to guide you every step of the way through your album design journey. The process of producing a handmade album is a very involved one. Following your wedding and upon receiving your final photographs I will select photographs that I think are best suited to be included within you album and then sit down with you to go through them and to discuss what it is you would like from your album design. I will then create the initial draft of your design which will then be uploaded onto your online gallery for you to view and feedback your comments. No matter what, you always have the final say over which images will appear in your final album. My initial image suggestions are simply that, a suggestion based upon the flow of your wedding day and the album type that you have chosen. Throughout the whole process we work together to produce the final book. 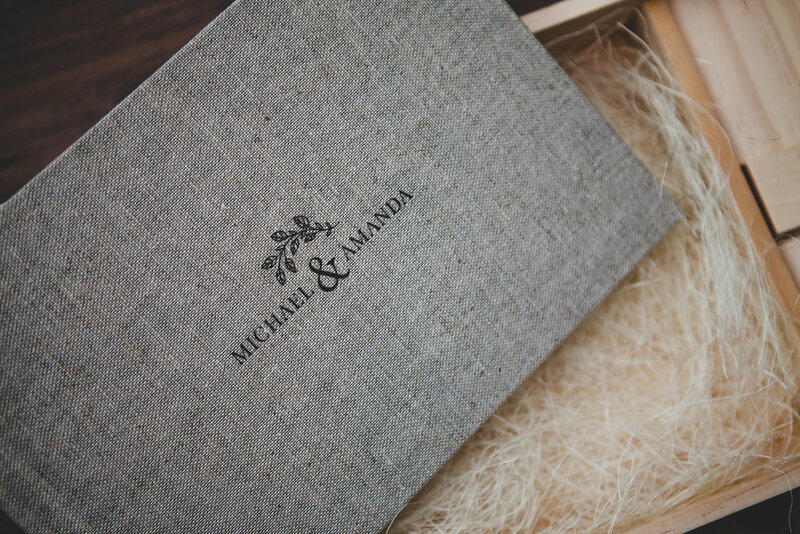 Once you are completely happy with the content and design of your wedding album the design is sent to Loxley, a specialist printing company in Scotland, to produce your final album.